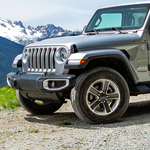 The Wrangler has removable windows and doors. You can choose a hard top, soft top, or no top at all. 18-inch aluminum wheels are available as well as signature LED headlamps. Body-color fender flares are in place to make a statement. Plus, there are some beautiful exterior colors for you to choose from.